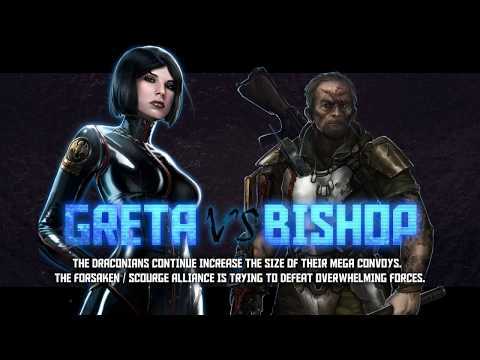 Greta has called in for reinforcements as the combined forces of Forsaken and Scourge have been a greater threat than they anticipated. This is your first chance to earn Greta’s Inferno Dragon, the flagship that will empower your Forsaken Mission Fleet. The event starts Thursday, July 12th at 9am PDT and ends Monday, July 16th at 9am. These features will disable at the start of the event for their respective worlds. For example, at 9am PDT, relocation will be turned off in World Alpha but will be available for all other worlds. However, you cannot relocate to World Alpha once relocation has been turned off for that sector. You can now see the recommended fleets, drops, points, and set value for targets. You can also find the nearest undamaged target. Supremacy is the third event in the Draconian Conquest event cycle. Defeat the Draconian Mega Convoys to earn points which allow you redeem awesome prizes. Draconian Mega Convoys Targets feature New Turret Carrier, Prototype Kodiak and Prototype Interceptors (with Prototype Weapons), and Draconian Ammo Carriers. 50% Price Drop for the Manticore Blueprint! Collect it now to prepare for the Hull Store Event in August! You must redeem either Makara’s Manticore or Greta’s Inferno Dragon to open the locked store. Impact Cruiser Redemptions have been reduced from 5 to 3. New Items added to the Event Store. Missile Storm Cruiser Lightning bolt Skin . Redemption of the Impact Cruiser has been increased from 3 to 5.